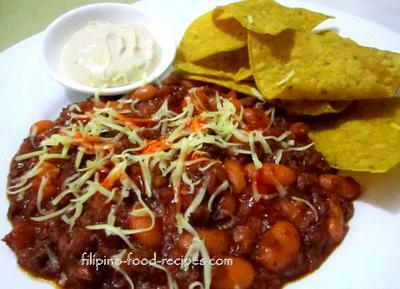 Chili con carne is one of those dishes Pinoys adapted and modified to suit our taste - just like the Filipino Spaghetti. My kids love my chili con carne as an afternoon snack, or even a full meal. I usually pair it with nachos or top a hotdog to make a chili dog. It is usually served with sour creme for some creamy richness. Another option is to serve it over pasta like spaghetti. 1 pack	Tomato sauce 200 gms. 1 pack	Tomato paste 70 gms. 2. Boil the beans until tender then drain and set aside. 3. Saute the garlic and onion, add beef and cook until slightly browned. 4. Add the celery and carrots, simmer for a while. 5. Add tomato sauce and tomato paste, basil and oregano then then add the water and simmer until the liquid is reduced and thickened. 6. Season by adding the sugar, chili powder, liquid seasoning, salt and pepper to taste. 7. Top with cheese and serve with a plate of nachos, or as hotdog sandwich topping with sour creme on the side.